Oh, hello there. What’s that you say? It’s been way too long since the last Ravellette family update? (OK. Maybe you only said that if you are Aunt Abby.) Never fear! A new update is here! There’s our happy, happy baby! We’re finally able to use the cloth diapers! After keeping up with disposables at a whopping $25/a week (perspective – that’s a quarter of my household budget, food and all, for the week! 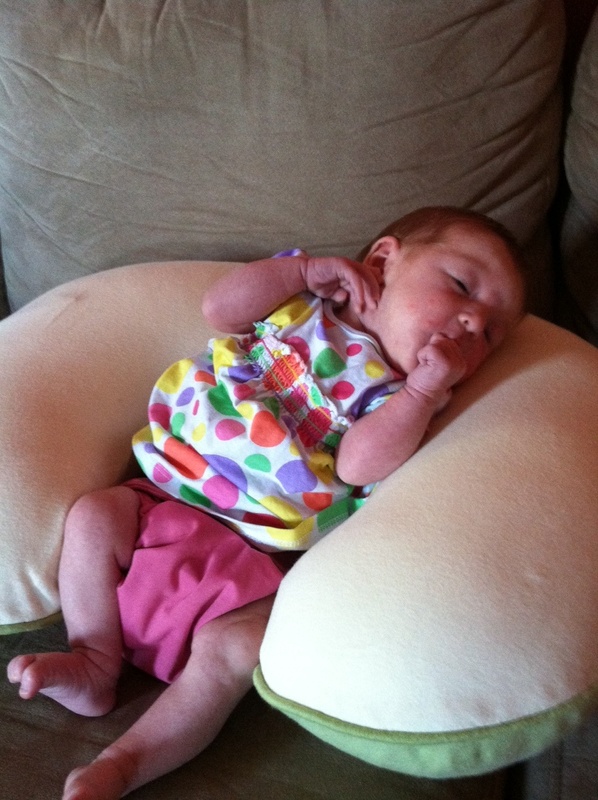 ), we’re thrilled that our Little Bug is able to fit into her adorable bumGenius Elemental diapers. For those of you who aren’t hip to the new cloth diaper trends (oh yes, there are trends in diapering), these aren’t your momma’s fold-’em-up-and-pin-’em-up diapers. These diapers, which will adjust in size with snaps to fit Paige Bug until she’s potty-trained, are as close to using convenient disposables as possible. They are one-piece diapers so there’s no worrying about separate liners or covers. As I mentioned, they’re adjustable in size (both length and waist) with their durable snaps. We bought 18 diapers for about $400. Recall that a box of 96 disposable diapers (about a week’s worth) costs 25 dollars. That means that as long as Paige Bug isn’t potty-trained by the time she’s 4 months old (umm… she won’t be), we’ll save significant money. We have an energy-efficient washer/dryer set, so the cost of cleaning them is negligible and so far we’re only having to wash diapers every two days. And, yes, they come out very clean. We took the advice of the cloth-diapering, home-improving bloggers over at Young House Love (the best, most addictive DIY blog I’ve found to date) and also purchased a bumGenius diaper sprayer that is attached to the toilet so that we can quickly and easily spray any… umm… material off of the diapers before they go in the laundry. We have yet to have a diaper come out of the wash that was stained. Something else that has yet to happen with cloth diapers? A blow out. (And trust me, Paige has given it the ole college try.) As the parent who has been pooped on 7,348% more than the other parent (oh, there have been some doozies), I’m thrilled with the extra-strong, hold-it-in-ness of the cloth diapers. Finally, as an added bonus, Paige’s diapers are really super cute. I mean, a. dor. able. We ordered several different colors and they are just so sweet-looking! They do create a bit of a wardrobe problem (as I mentioned above) in that they make our skinny little girl have quite the big booty. Note: A baby wearing a body suit and fake jeggings over a cloth diaper booty will make you laugh until you cry (at least that was true for me). We’ve learned that coverall-jumpers, shirts + pants, or dresses are much preferable to the ever-popular body suit + legging combo when it comes to Paige’s outfits when she’s wearing cloth diapers. OK. I promise that’s all I will say about cloth diapering. For now. Coverall jumpers like this one work better than onesies and leggings with cloth diapers. Also, they’re adorable. 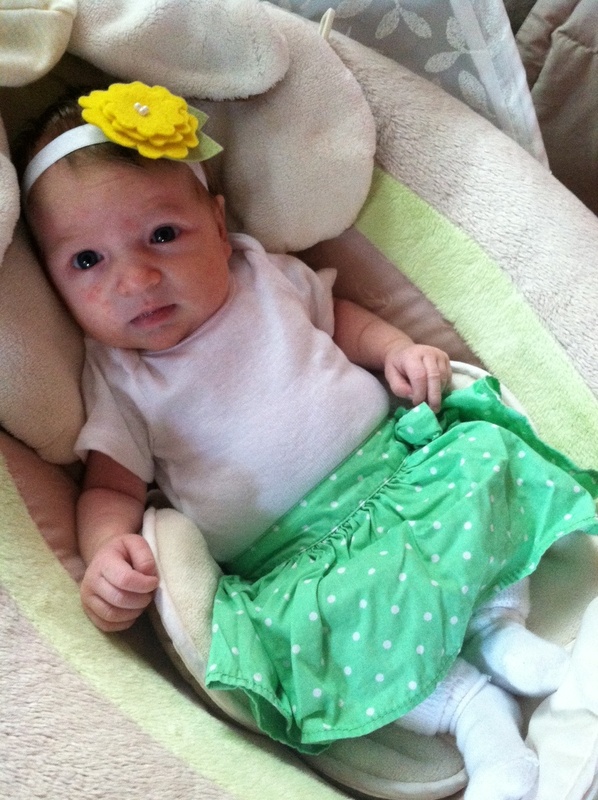 The diapers are so cute that we just pair them up with t-shirts and skip the leggings/bloomers sometimes. Like I said, a. dor. able. Daddy’s gone back to work. 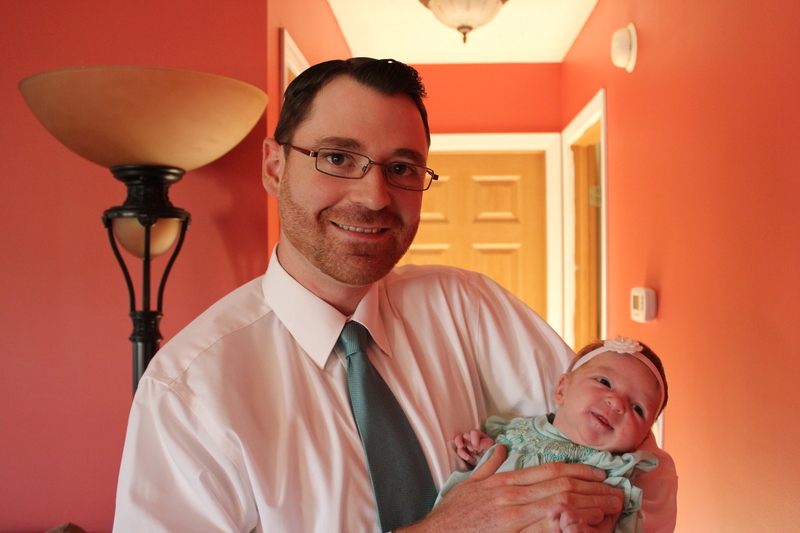 Jeffrey got three weeks off for parental leave (I told you – we are so thankful for Purdue benefits!). He made the most of that time with Paige-and-Daddy-chest-naps, helping Paige explore, and working around the house (just wait until I tell/show you all that he canned from our garden… future post!). It was hard for Jeffrey to go back to work, and it was hard for Paige and I to let him! We had grown quite accustomed to spending all day every day with him! Jeffrey truly is my best friend and we understand how to be in the same space and still give each other space. We really do work/live/play well together. Some people might think that being “cooped up” at home together for three weeks straight would have led Jeffrey and I to get a little tired of the constant together-ness, but we didn’t. We didn’t even have an argument! danae has been talking/writing a lot about enjoying each season of life in its turn (check out her great post about it over at danae: student of life), and, let me say, I am. What a fun, joyful, blessed, amazing season we’re in right now! But, I am looking forward to growing old and retiring with this guy. I can’t wait until we can both hang out at home all the time – what fun! (I mean, obviously I can wait. I’m only 26 and am not looking to retire anytime soon.) Anyway, Paige really misses Jeffrey during the day, too. She’s happy and content pretty much all the time, but she knows that something’s not right when Daddy’s not there. How do I know? 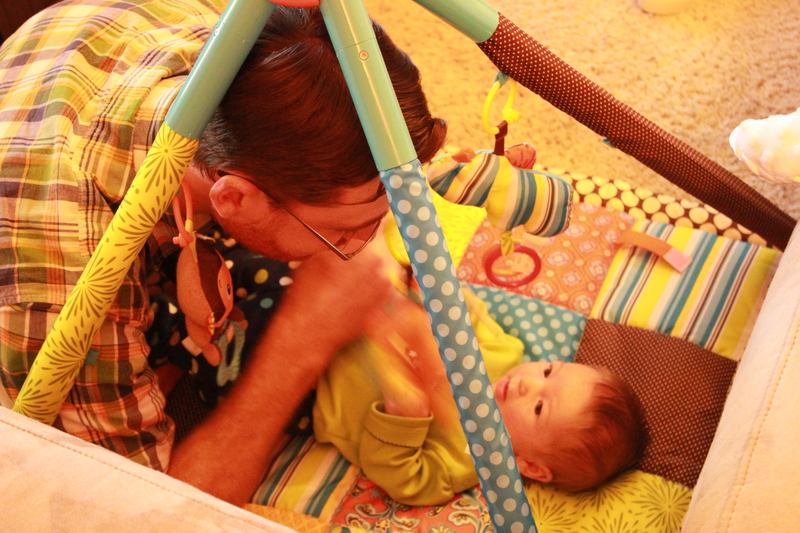 Well, this baby is determined to get her quota of Daddy-time each day, no matter the cost. Since Jeffrey’s gone back to work, when he tries to put her down for the night when it’s her bedtime, this girl fights sleep to the bitter end. If you’ve ever been around small children, you’ll know what I mean when I say she has the “no, really, I’m not *yawn* sleeeeepy” look. Those big, beautiful, blue eyes are open, but boy are they ever tired, heavy, and glazed over. 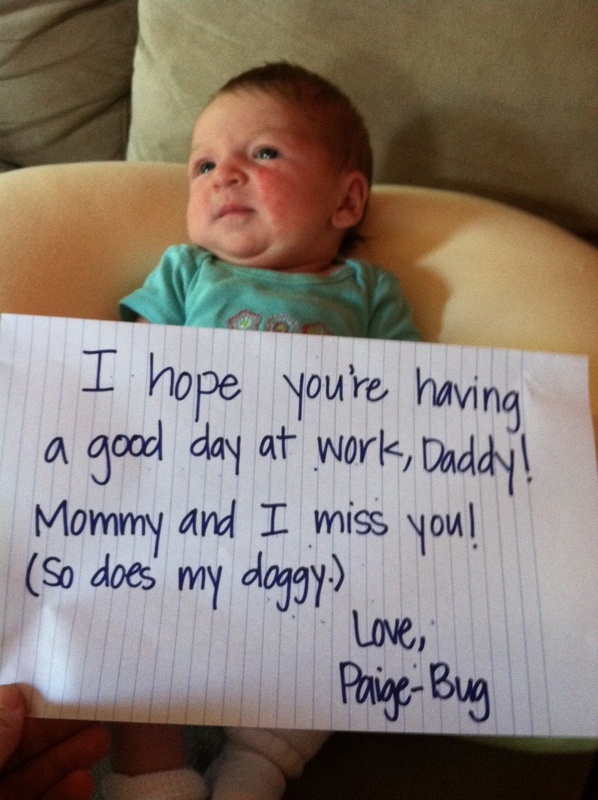 Paige doesn’t want to miss a minute of her Daddy-time since she doesn’t get to see him as much during the day now! But don’t let Jeffrey fool you – he’s just as determined to get as much Paige Bug time as possible at the end of the day, too. In fact, he’s quite the baby-hog in the evenings! It’s Autumn! Hooray! It’s our favorite season and we’re so thrilled that football, pumpkins, apples, and chilly nights (and chili nights!) are back. In fact, we celebrated the return of Fall by taking Paige to the Apple and Popcorn Festival a couple of weekends ago in nearby Brookston, Indiana.We had never heard of it until I stumbled across someone’s Facebook post about it, so we decided to be spontaneous and check it out. It was a fun trip and we got some delicious kettle corn and yummy apple dumplings (not as good as mine, but they required far less effort), and Jeffrey even got to go to a fish fry (this was a treat for him… I was a good sport, but it’s not my thing). We had a nice family outing on a beautiful day, but I have to say, there was a disappointing lack of apples and popcorn at the Apples and Popcorn festival. It was really more of a craft bazaar. I think next year we’ll try to go earlier and catch more of the live music… and try to find where they were hiding the caramel apple booth. 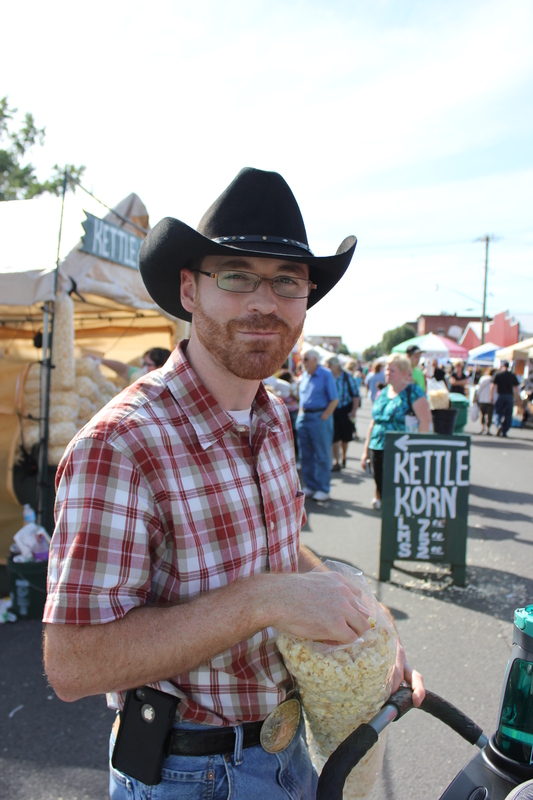 The kettle corn at the Apple and Popcorn Festival did not disappoint. Yummy! Pit stop at the car for a diaper change. Can you tell how excited Paige was to go to the festival?! This is the excited face she wore the whole time. Paige is going to church! Paige has gone to church for three Sundays and Wednesdays now. She’s even gone to LIFE group. Surprisingly, we’ve actually been getting to Sunday school more on time with Paige than we were pre-Paige! 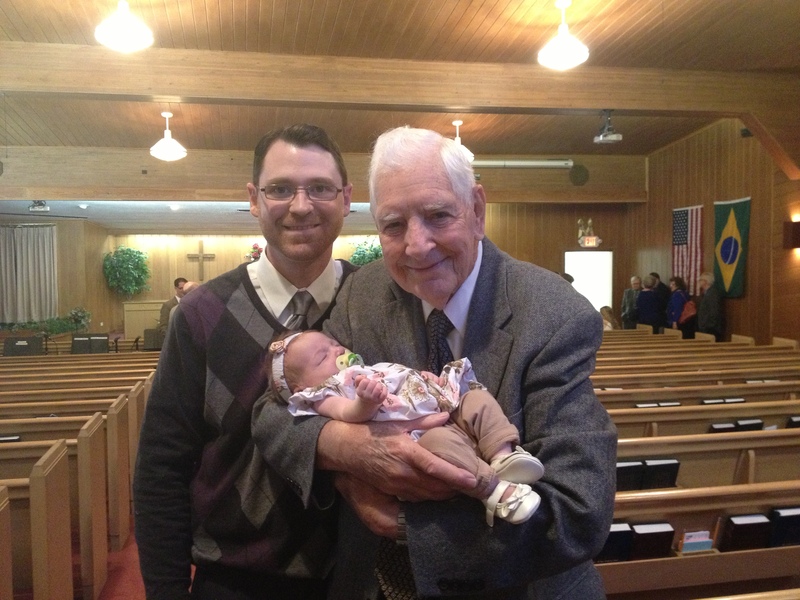 (And, in a very impressive showing, our first Sunday at church, all three of us were color coordinated. It will probably never happen that way again, but at least we can say that we had our act that together once.) We’ve got a pretty good Sunday morning routine down that starts Saturday evening with Paige’s bath. She’s done great at church. Because she’s still so young, we’ve been keeping her with us in class and service and, for the most part, keeping her in her car seat/carrier to help deter people from asking if they can hold her. We want to avoid Paige being passed around at this point to help decrease her exposure to those early Fall colds. This has meant a couple of times where Mommy’s had to be a bad guy and say, “No, I’m sorry. You can’t hold her right now,” but for the most part people have been really great about admiring sans touching. As for how Paige is handling church outings, she has pretty consistently fake-slept through church. “What’s that?” you say. “Fake sleep?” Yep. 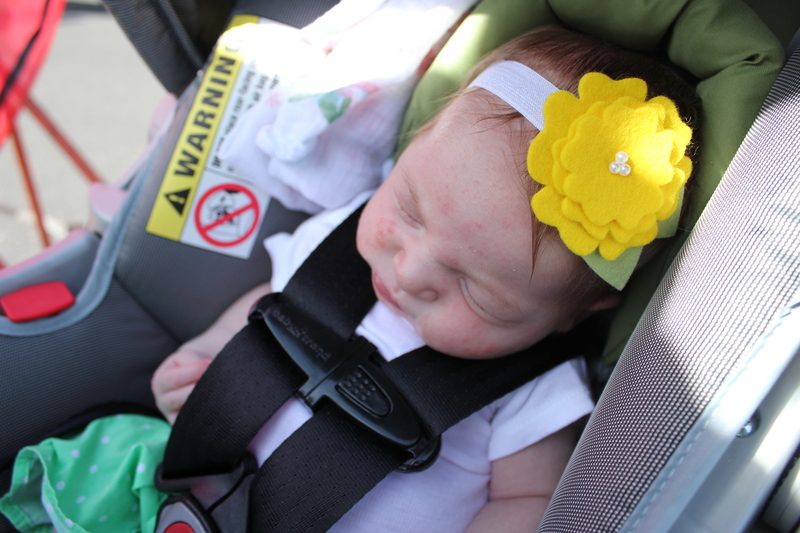 That’s how Paige copes with outings – she fakes sleep until she’s home safe and sound with Mom and Dad. We know she’s fake sleeping because 1) Paige has distinctive breathing patterns when she’s really sleeping and 2) we catch her peeking through her beautiful eye lashes to see where she is and what’s going on from time to time, only for her to hastily close her eyes again until we’re home. We did have a bit of a hubbub this past Sunday. We walked into our Bible class about 5 minutes late (first time being late since Paige started going to church!). I took Paige out of her car seat after we sat down and gave her to Jeffrey, who looked down and saw that he had poop on his hand. First blow out in a public place! So, I had to get up (after only just having sat down) to take Paige to the Ladies’ room for a make-shift baby wipe bath and diaper change. While I was gone, Jeffrey discovered that we didn’t quite wipe all the poop off his hand before we left, so he had to get up to wash his hand. Did I mention the door to the classroom is very noisy? So Jeffrey came back to class, then Paige and I came back. Then, barely 15 minutes later, I had to take Paige to the nursery to feed her (we always plan on leaving class a few minutes early so that Paige can eat and get a fresh diaper in time to be in service). So, in case you lost count, the Ravellettes noisily interrupted class by coming and/or going through the squeaky door six times in one class period. Did I mention we go to a class of mostly older people who probably haven’t had to worry about young children disrupting Bible class in years – nay – decades? It’s a good thing that everyone loves Paige! This past week, Paige also got to spend her first snuggle time with Mr. Sam. 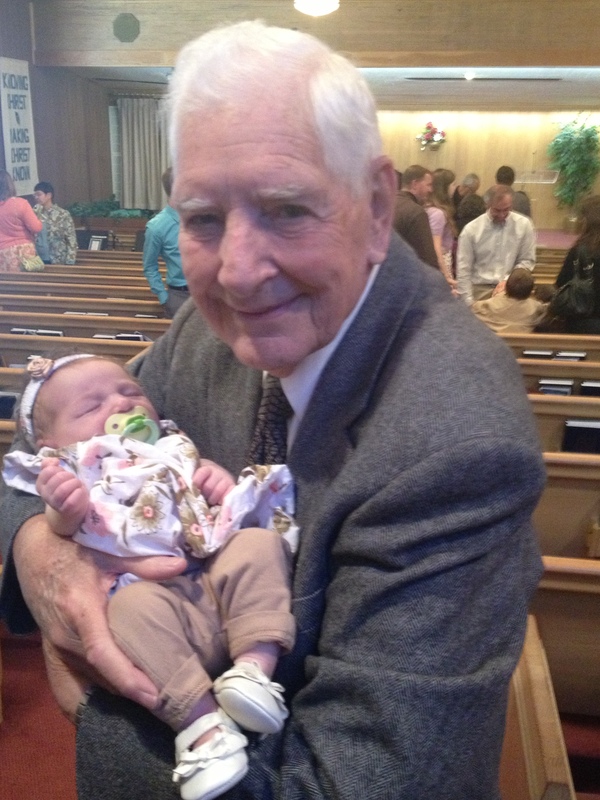 Sam is the super-sweet, wonderful Grandpa to every child in the church and he was tickled pink to get to hold Paige. He even sang his special Swinging, Swinging song with her while, of course, swinging her! 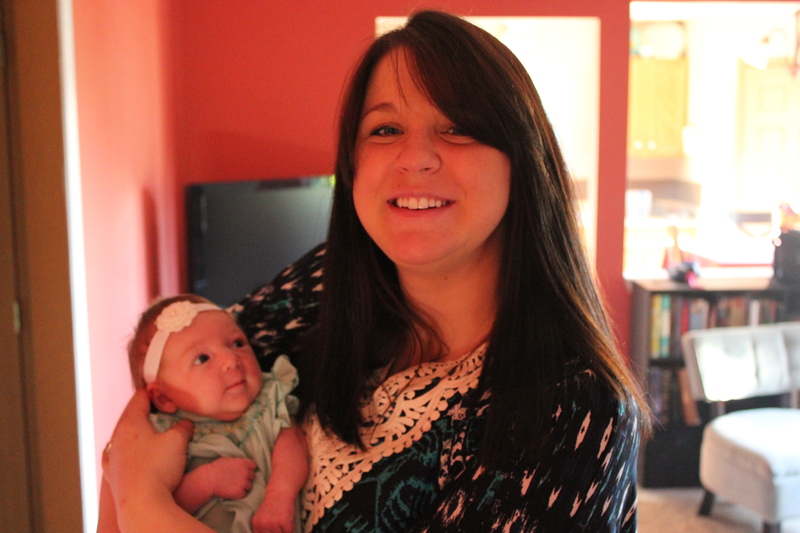 Sweet Ms. Margaret got to hold Paige, too. Mr. Sam and Paige – Swinging ‘neath the old apple tree. 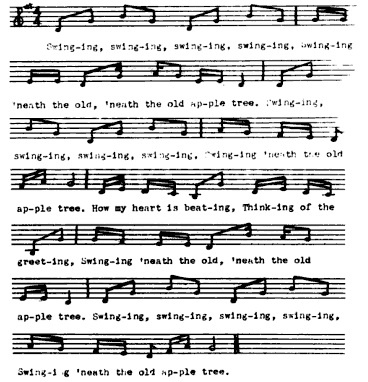 I wasn’t able to find an audio file of Mr. Sam’s song, but if you can read music then you should be able to see how sweet of a song it is. Paige has new skills and new ways to play! Our Little Bug loves to spend a few minutes each day on her tummy. She’s a pro at holding her head up and looking around. She also tries to scoot with her little pudgy legs. She hasn’t quite figured out what to do with her arms yet, though. Paige also likes to lie on her back on her gym-mat and play with the animal toys that hang just low enough that she can reach them with her little hands. She loves to to hold on to things these days, and the rings on her elephant are at just the right height for her to grab. 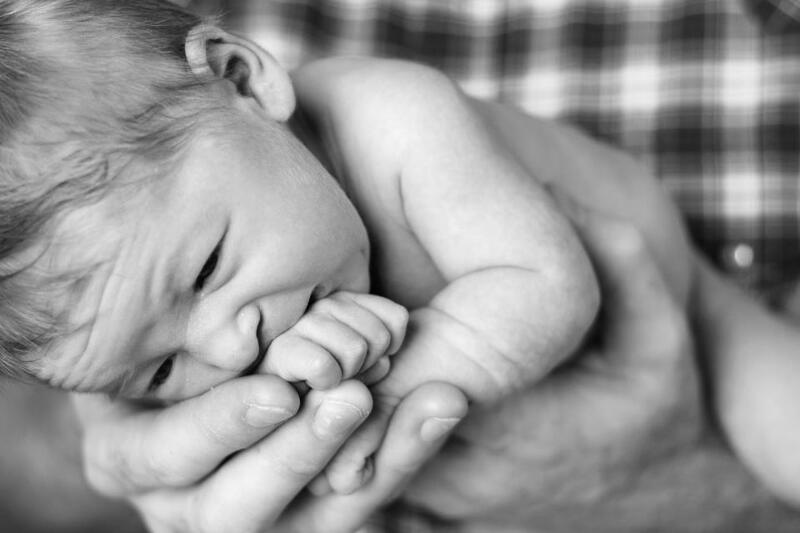 (Which is much preferable to grabbing Mommy’s hair in her freaky-strong baby grip.) 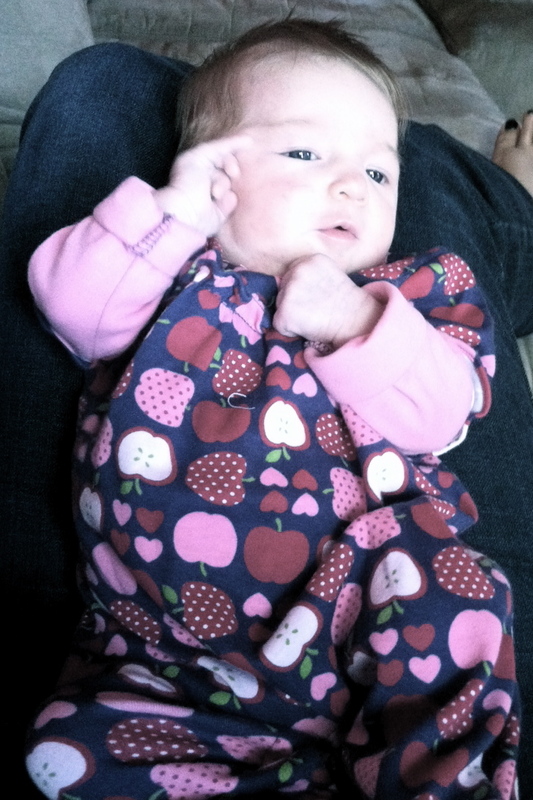 Paige is also becoming more of a chatterbox each day. She’s figuring out that, instead of just sighing and cooing (or crying) she can intentionally make loud and different noises. You know that she’s about to talk when she’s quiet for a moment and gets a look of concentration on her face (not entirely unlike poopy-face-Paige). Then, suddenly, she’ll let out a clear, loud “Oh!” or “Ah!” We’re not sure exactly what she’s saying, but we know it must be a funny joke, because every time she says one of these Paige-words, she smiles and smiles. She’s very proud of the funny jokes she can tell and we can’t wait to hear her next punchline! She’s also started trying to sing along with Mommy and Raffi when we sing and dance. Her favorite song to sing and dance to is Goin’ to the Zoo. Finally, Paige has a new way she can eat! 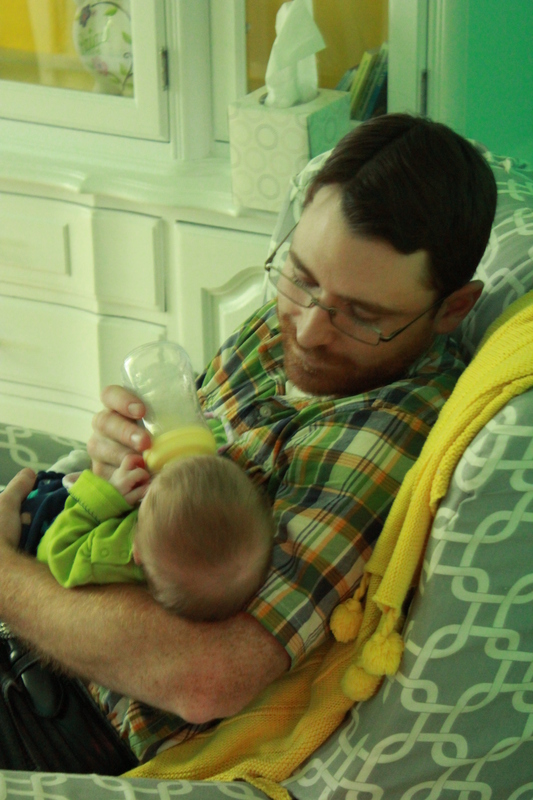 Last week, Daddy gave her her first bottle. For the most part, she’ll only get bottles when she’s not with me, but we wanted to start slowly introducing them to her since there are some times coming up that she won’t be with me (e.g., when her Daddy and I go to the Michigan football game next week and when Mommy goes back to work full time). Mommy’s working again. I’m not technically “back” at work yet, but I have started working from home this week for about 20 total hours a week. For the most part, Paige does really well listening to her music and playing while I work nearby. [Yesterday was not one of our better days though, because Paige was dealing with a tummy ache and she just wanted to be held. Thankfully, I didn’t have very much in the way of time-sensitive things that I had to do yesterday and I was able to hold her all day. I hate that she didn’t feel well. 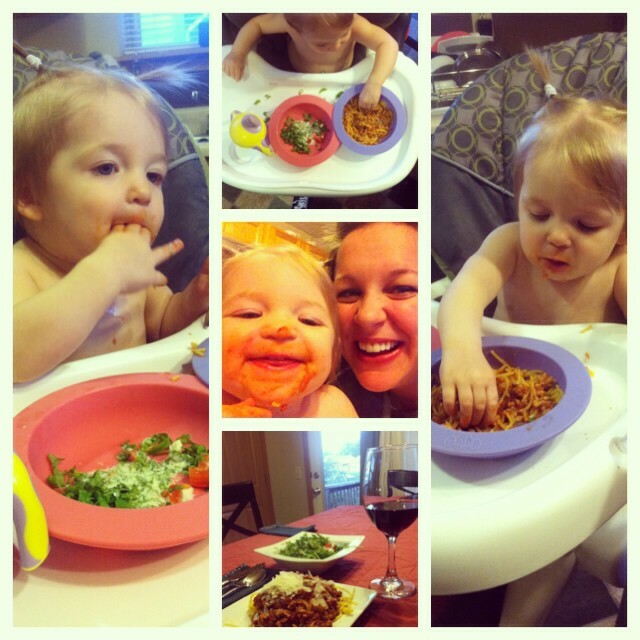 My normally very content and happy baby would cry (I mean really cry – tears and all – talk about breaking her Mommy’s heart!) anytime I put her down. Like I said, I hate that she felt puny, but I did not mind the extra snuggle time at all. Thankfully today she’s back to her smiley self.] In addition to working on the computer from home, I’ve also had to pop into the office a few times to print things, so Paige has come to the office with me. We’ve got two more weeks of me working from home before I go back to the office full-time on October 15. I’m not looking forward to going back because I love my time at home with Paige. I love taking singing and dance breaks during the day and being here at nap time so that I can snuggle and snooze with her. However, I am blessed to have a great job working for and with my Elmwood family, whom I love. I’m also blessed that Paige will be with me at work part of the time. And, when she’s not with me, she’ll be with Ms. Carol! My brother and sister and I were very blessed when we were growing up that, although we lived several hours from our grandparents, we had “adopted” grandparents at our church (we love you Nobe and Phyllis!) who loved and cared for us (and yes, spoiled us) just like grandparents. They’re still part of our family to this day! I’m so glad that Paige will get to spend time with Ms. Carol because I know that it will be like going to Grandma’s house during the day. So, although I’d rather just get to stay home with my Little Bug, I’m blessed to be going back to a job I love while a person I love looks after her. 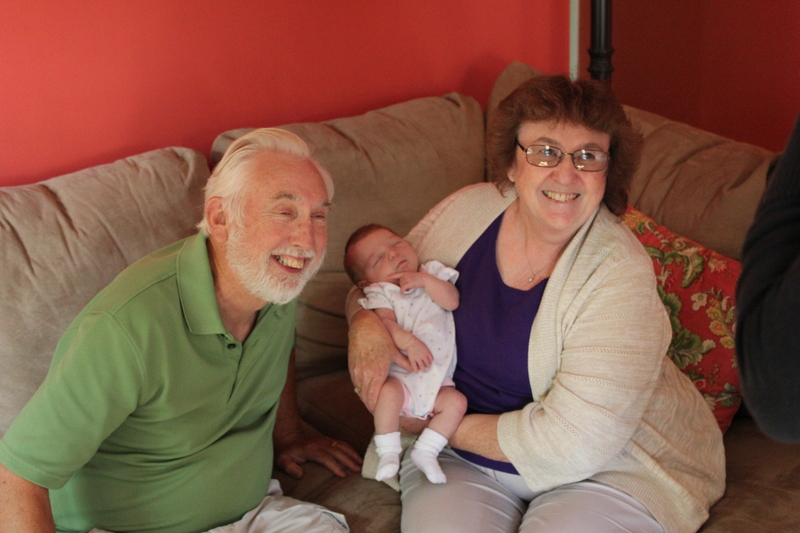 Paige with Nobe and Phyllis, my adopted grandparents, when they came to visit! 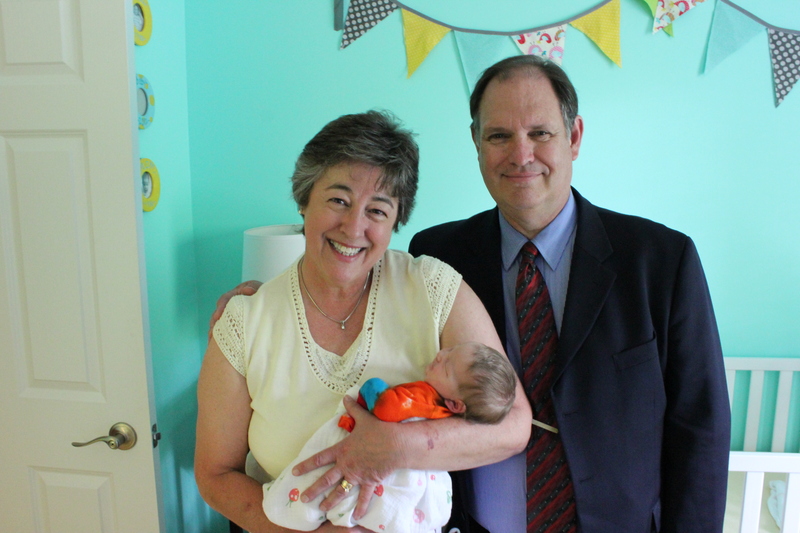 Paige with Ms. Carol and Mr. Bill when they came to visit on her first full day at home! Paige loves her bath! The last post about bath time with Paige may have left you with the impression that, at best, Paige tolerated bath time and, at worst, she thought it was cruel torture. And, that was the case. Since then, we’ve been giving Paige baths in her bath pod and she L-O-V-E loves bath time! If you’re not familiar with a bath pod, Jeffrey would tell you that it’s essentially a five-gallon bucket. While it’s a bit more sophisticated than that, I can see where it could give one that impression. Paige gets to sit upright (with a little help from a hand towel in the bottom of the tub and Mommy’s hand on her back) in the pod and the warm water comes up to her little armpits. She smiles for her whole bath! Her favorite part is still getting her hair washed but that’s no surprise because, really, what girl doesn’t love to have a nice scalp massage? We’ll try to take an updated bath video soon! Paige sleeps (and sleeps… and sleeps) at night! One of the first questions that people always ask us when they see us is some variation on “How’s Paige sleeping?” or “Are you guys getting any sleep?” The short answers are “Like a pro!” and “Yep!” Paige only gets up once during the night for a fresh diaper and a mid-night snack. Yep – just once! Her first block is usually between 6 and 8 hours and her second block is usually 3-4 hours. The only trick is getting her to go to sleep for the night in the first place because, as I mentioned above, she likes to fight sleep to stare at Daddy. But, we seem to be getting better and better at a routine that helps her go to sleep quickly and she’s usually in bed for the night around 9 p.m. She’s even doing a good job taking a nap in the early afternoon and, for the most part (minus a few cat naps) staying awake for the rest of the day. The only time that we really have trouble getting her to go down at night is if she’s been held a lot during the day. She sleeps hard when people hold and cradle her, so it’s no surprise that on those nights after she’s been held a lot, she’s really not all that tired. But, we’re doing good at making sure that she has the appropriate amount of awake time during the day so that days and nights don’t get switched around in our house! Paige’s newborn photos are ready! The amazingly talented Beth W. who took our maternity photos stopped by La Maison before Paige was two weeks old to snap some newborn pictures of her. She did a great job (no surprise there!) and we’re thrilled to have these great photos of Paige! If you’re in the Lafayette-area and are willing to barter for family photos, Beth does wonderful work and is just a wonderful, light-filled person to know! I’d be more than happy to get you in touch with her. 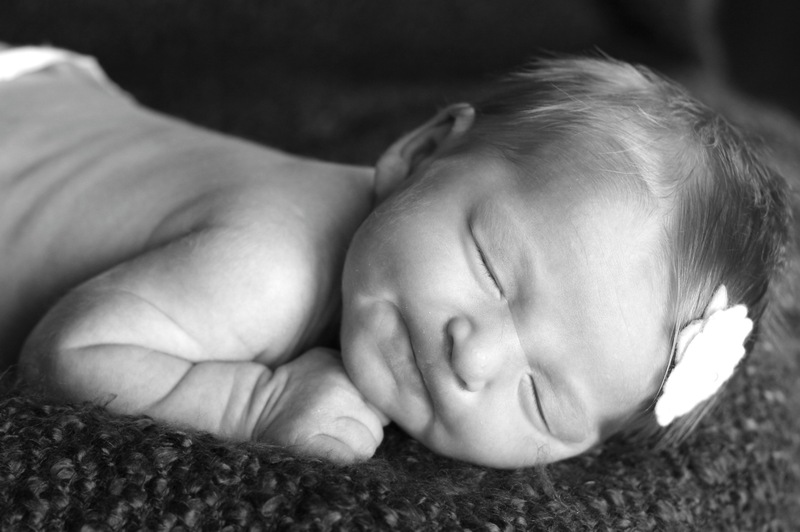 You can click here to see all of Paige’s newborn photos. So that’s all the news that is news in the Ravellette house. Hopefully I can stay more on the ball so that it’s not another 3 weeks until we update you on life within our house. For now, please keep our little family in your prayers. Also, we’d be honored to pray for you and your family – let us know how we can pray for you! 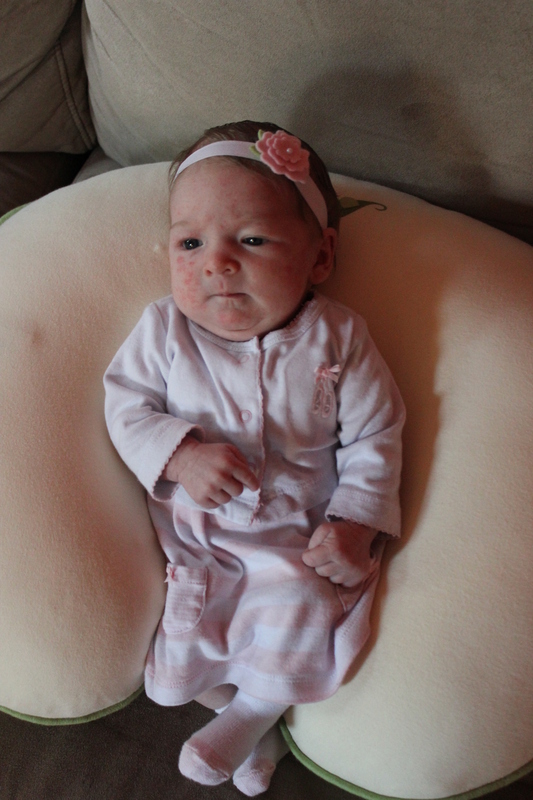 Quick Update – 3 Weeks Old! This is Paige’s “I’m-older-and-wiser-now” face. She’s three weeks old already! Paige had her two-week check-up earlier this week. She’s now 7 lbs, 15.5 oz and 20 inches long. Mom and Dad think that the new 3/4 inch is all in those long, skinny, kicky legs! Dr. Mulder says that Paige’s head control and neck strength are at a level that he’d expect to see by two months, so she’s getting quite strong for a little girl! The most visible sign of Paige growing is her hair! When she was born, her hair didn’t reach her ears and now we brush it behind her ears. 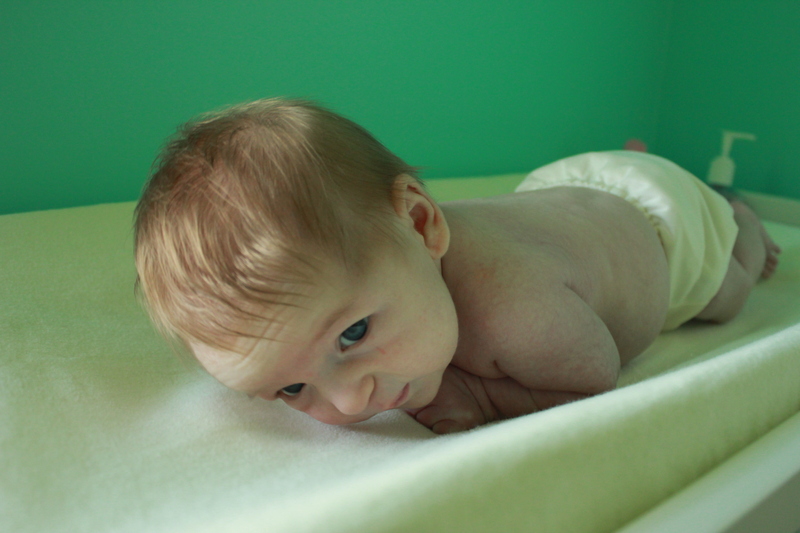 This girl is going to need a hair-cut before she can crawl, at this rate! Paige has started to respond to some of the frequent kiss attacks from Daddy and Mommy with her priceless, toothless smile. She’s also started to “talk” more. She’s not cooing yet, but she’s recently discovered that she can make little sigh noises and sometimes we’re sure she’s just sighing to hear herself sigh. It’s pretty precious. Paige is starting to have a lot more awake time during the day and it’s a lot of fun to see her discover ways to play and interact. She loves to sit up with the help of her Boppy and look around the living room (she loves our brightly colored living room walls). 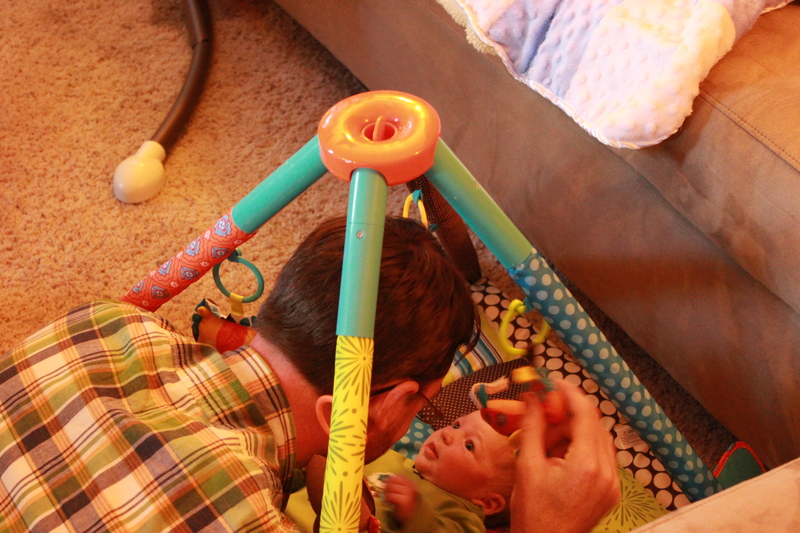 She also likes laying on her back on her play gym and looking at the different toys and patterns. Her favorite toy is a small stuffed cow rattle that can make different “crinkly” noises. She loves to lay on Mommy’s lap and follow the cow with her eyes. 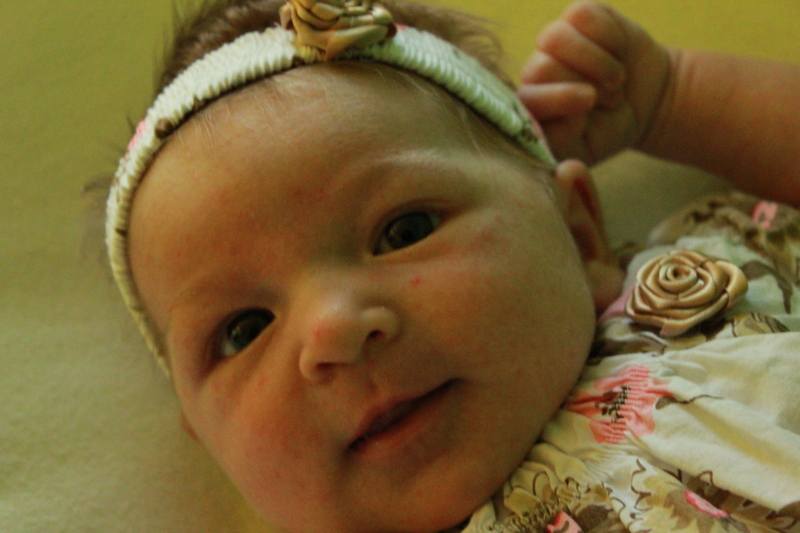 She turns her head to respond to different sounds – especially Daddy or Mommy talking. Finally, she’s a rock star at studying people’s faces – especially ours – and also does really well tracking things with her eyes and by turning her head! This week, Paige enjoyed her first Michigan Football game (she enjoyed it because she went to bed before it got really ugly) during her first play date with her friend Joel (it was his first U of M game, too!). 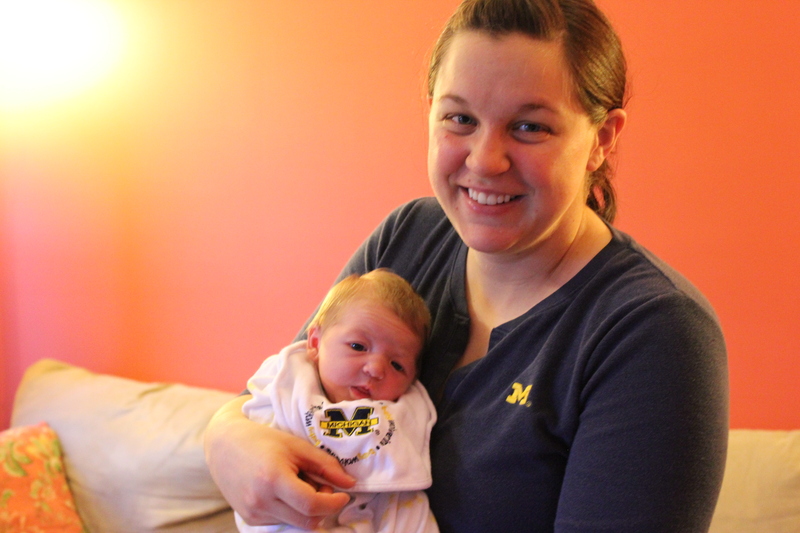 Thanks to Uncle Matt, Paige was able to sport some awesome “Wolverine Baby” fan gear (along with her ducky PJs) for her first U of M football game! Go Blue! Paige also took her first trip to Mommy’s office at church, the BMV (we lead a glamorous life), and Meijer for grocery shopping. She’s getting all geared up for her first Sunday at church this week! Paige also had her first professional photo shoot last week. Sweet Beth W. (who did an excellent job on our maternity photos) came by our house to snuggle with Paige and take some newborn photos of her. We’ll share them with you when they’re all ready, but for now please enjoy this awesome preview picture that Beth posted for us. Early last week, we finally introduced the paci to Paige. She does really well with it. She doesn’t depend on it and she doesn’t have to have it all the time, but it is a good soother for her when she gets fussy (which is usually only when she has a bit of a gurgle-y belly). She really likes to hold on to the paci and she even likes to pull it out – but she needs to grow in motor skills a bit to master putting the paci back in. She tends to get a bit frantic when she pulls it out but can’t get it back! 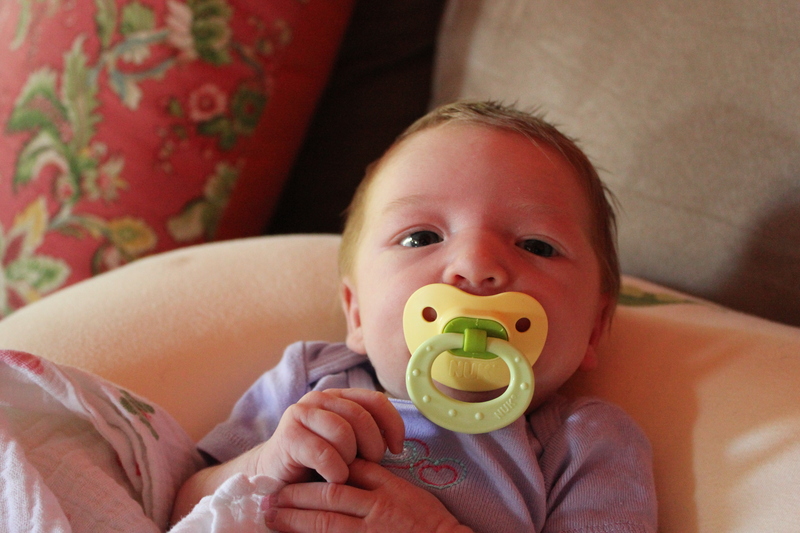 In case you thought our growing baby wasn’t still tiny, please note the pacifier that looks like it’s eating her face! 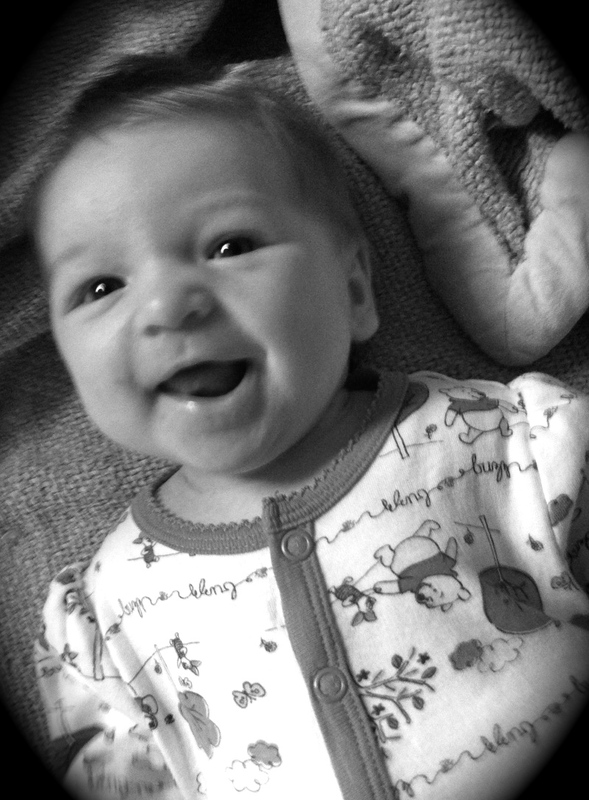 Paige has also discovered that she really likes Raffi and the Pastoral Symphony from Handel’s Messiah. Raffi for play time, Handel for nap time. Finally, Paige really likes the new way that Daddy swaddles her with her arms out. Just like Mommy, Paige prefers to sleep with her arms above her head. A lot of you have been asking about how Paige is sleeping and the short answer is, she’s doing great! Paige consistently gives us two, four-hour blocks each night (four hours from start of feeding to start of feeding) and usually adds on another three-hour block in the morning. Our only struggle is getting her to start her night earlier – she’s a bit of a night owl. We’re getting better, though. 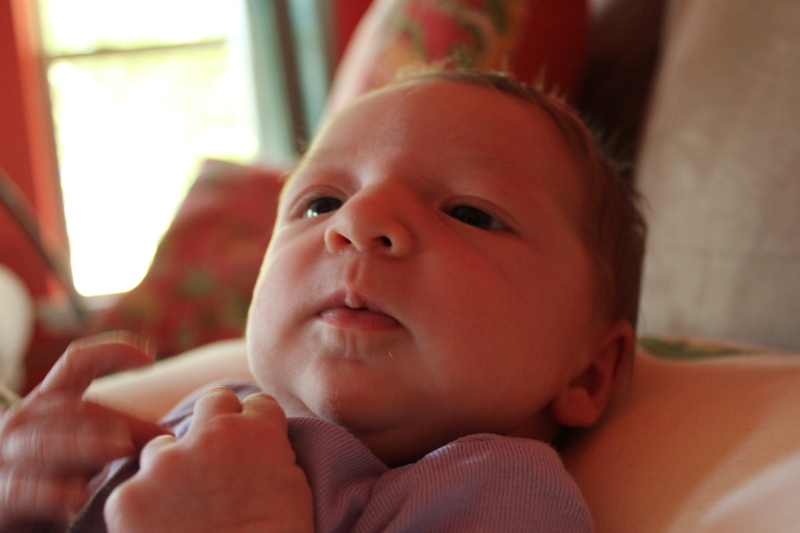 Instead of 1 a.m., we’re now averaging about 10 p.m.
We continue to be amazed by the way that Paige changes each day. One thing hasn’t changed – the way Mommy and Daddy love Paige more and more each day! 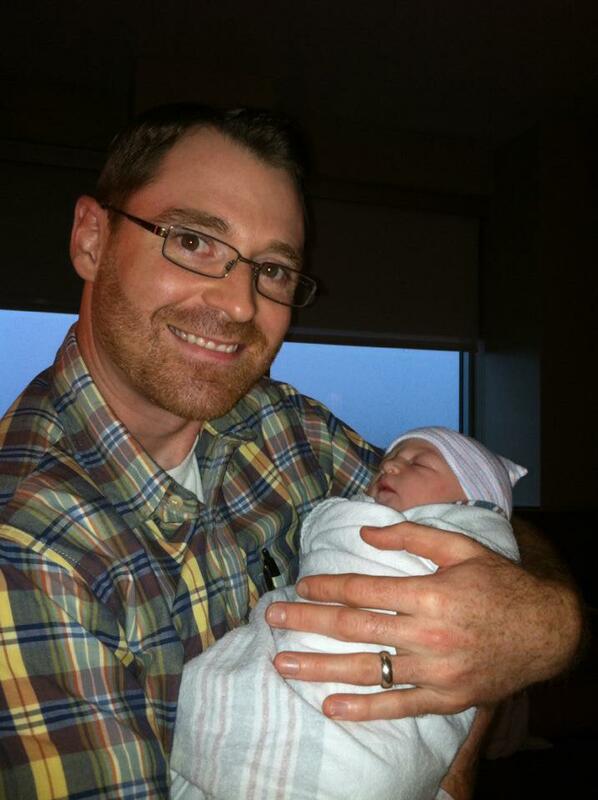 We’re so happy to introduce you to our sweet Baby Rave, Paige Esther Ravellette! Paige under the lights – minutes after birth and she’s already perfectly pink! 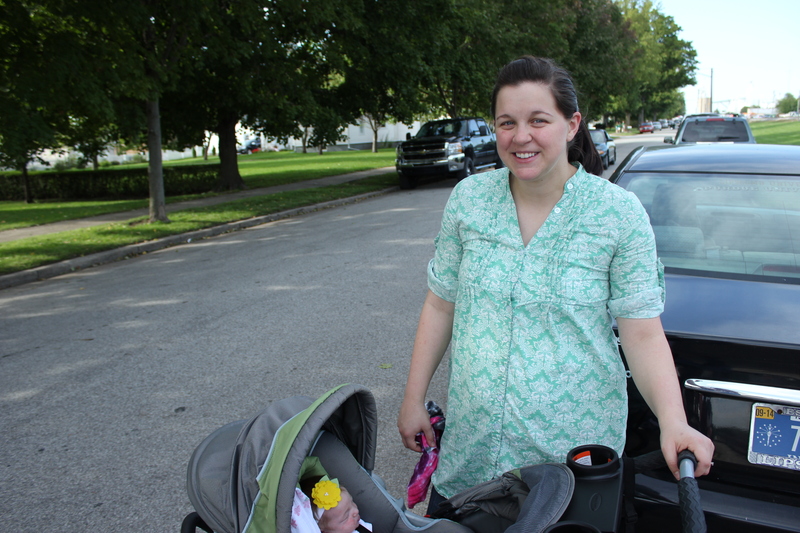 Paige was born at 4:58 p.m. on Thursday, August 16, 2012 in Labor and Delivery Room 2 at IU Health Arnett Hospital in Lafayette, Indiana. 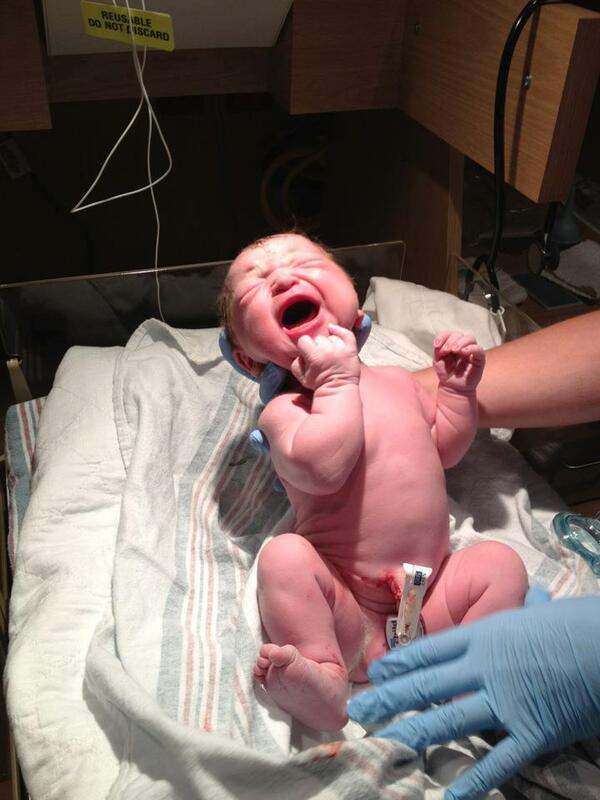 Paige weighed 7 lbs, 13 ounces and was 19 ¼ inches long. Stay tuned for Paige’s birth story! 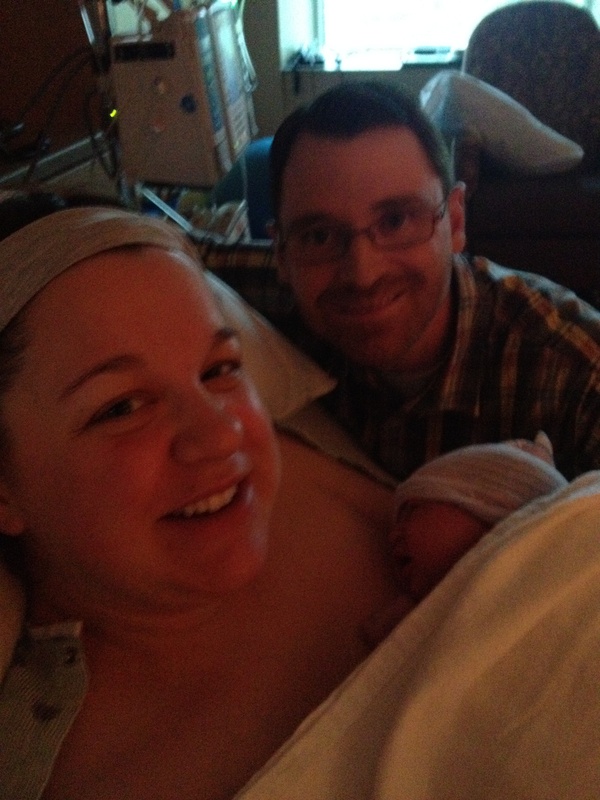 To show what a good sport I am, I’ll set my self-consciousness aside and share our first photo as a family of three! This is my new favorite picture of all time! I can’t even look at it some times because it just melts my heart – my two favorite people together!